A story that lasts in the heart is the one that provides greater meaning for its Audience. Think back to this year’s season of Westworld. What was the one episode you remember? There’s only one, right? The one with the Native American? You remember that episode for one reason, and one reason only: it told a complete and meaningful story. The appreciation of the meaning of a story is directionally proportional to the amount of time that passes from initially receiving it. Exit a theater or head upstairs after a great episode, and you recall scenes, moments that resonated with you. You may not be able to figure out what it all meant—but you appreciate something there beneath the surface. Days and weeks pass by, and suddenly the glitz and glamour of the storytelling, and the message—or storyform—of the narrative rises to the top of your consciousness. The distraction of the subject matter gives way to purpose and meaning. That experience of reading a draft you hid in a drawer for six weeks? It’s the same thing Audiences go through the further they get from encountering your story. They finally get what you’re trying to say. And that’s because it had something to say. 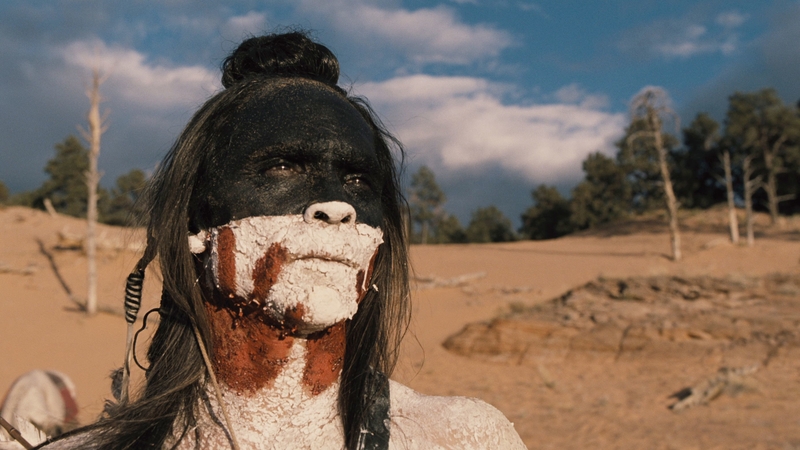 Many would think Akecheta, a member of the Ghost Nation, the Main Character of the narrative. After all, we spend a considerable amount of time with him. We empathize with his desire to be one with his wife, Kohana. And he seems to be the driving force behind each and every scene. To fully appreciate the meaning of a story, one must divorce themselves from matters of agency and issues of functionality. In other words—the Main Character is not always the Protagonist of a story. Main Character is a perspective, a point-of-view provided by the Author as a means of communicating or arguing the intent of their narrative. The Main Character perspective represents the “I” perspective as in I’m this character. A Protagonist is a function. The Protagonist drives the story forward by Pursuing a Story Goal and by Considering options along the way. Sometimes—most times, but not always—the character representing the Main Character point-of-view also functions as the Protagonist. T’Challa in Black Panther, Lightning McQueen in Cars, and Tonya Harding in I, Tonya play the dual role of Main Character and Protagonist in their respective stories. Other times—more often than one would think—the Main Character watches another character play the role of Protagonist. Max watches Furiosa in Mad Max: Fury Road, Eliot watches E.T. in E.T. the Extra-Terrestrial, and Nikita Krushchev watches Lavrentiy Beria in The Death of Stalin. In each of these examples, the character fulfilling the function of the Protagonist is the Influence Character of the story. The Influence Character Throughline challenges the point-of-view held by the Main Character, forcing him or her to grow. Furiosa’s actions motivate Max to stop running. E.T.’s headstrong approach inspires Eliot to start running. In both cases, the Influence Character’s unique way of seeing things shake up and wakes up the Main Character. Kind of like what Akecheta does to Maeve in this episode. Akecheta’s role as both Protagonist and Influence Character plants us firmly in Maeve’s point-of-view. His attempt to piece together bits and pieces of Ford’s narrative and his efforts towards finding a way out challenge Maeve to come to a better understanding of her powers and abilities (Influence Character Concern of Conceptualizing and Main Character Throughline of Understanding). Throughout this season and last, Maeve encounters evidence and signs of something greater but struggles to understand it all. The maze in the dirt outside her ranch house. Members of the Ghost Nation seemingly attacking her and her daughter. The “blood” on the stone with an intent to warn of something. The fact that she can control the other hosts with her mind, but doesn’t understand why is what focuses her Main Character Throughline in Understanding. Maeve would remain locked in this confusion if it weren’t for Akecheta’s story. Upon finding the image of the maze, Akecheta begins to lose his mind—marking the image wherever he goes and hearing a voice within him never heard before (Influence Character Throughline of Psychology). Conceptualizing shifts in his programming is the main Concern in Akecheta’s Throughline. Reborn as a vicious killer from his previous “pastoral experience” build, Akecheta lives the dysfunctional life of a man without masters and without fear—yet still forbidden to take the lives of certain privileged individuals. Logan’s words “cracked something open” within him and finding a way out of this “wrong world” becomes Akecheta’s mission. The recognition of something familiar behind Kohana’s eyes and the sense of a past life only drives him further. Where is the door? The replacement of his wife with another and the recognition that others suffer the same loss of their beloved ones forces Akecheta to take drastic action: to find out what lies on the other side of death. Akecheta discovers Kohana standing lifeless among the rest of the hosts and begins to cry. That was the moment I saw beyond myself. My pain was selfish. Because it was never only mine. Akecheta’s discovery represents a temporary lack of motivation in his Throughline as Influence Character. Driven up until now by Awareness, this identification of Self-Awareness dampens his impact. The focus on his Kohana and his exit kept them all in a state of slumber (Overall Story Throughline of Mind). Everybody in this place…there was someone who mourned their loss. Even if they didn’t know why. Re-asserting his connection with Maeve’s first-person perspective and her problem with Understanding, Akecheta takes up his Influence Character role again. I dedicated my life to sharing the symbol. It means you can see. My primary drive is to maintain the honor of my tribe. I gave myself a new tribe. To spread the truth. This sensitivity to Awareness causes him to focus on Inequity—the “wrong world,” and directs his efforts towards Equity—or a place where they can restore all that was lost (Influence Character Focus of Inequity and Influence Character Response of Equity). There isn’t one world. But many. And that we live in the wrong one. This would help them find the door. I wanted to help you too. I wanted to warn you. But in this world…it’s easy to misunderstand intentions. Having lived under the threat of abuse for several years, Maeve blindly misunderstands Akecheta, confusing him at times with the Man in Black. I wanted to give you the truth. I watched over you day after day trying to keep you safe. Like most victims of abuse, Maeve projects her experience with others onto those with better intentions (Main Character Problem of Projection). The vision of Akecheta outside her door switches to that of the Man in Black. Thinking the maze outside her ranch most likely another instance of violence from her abuser, Maeve collapses. But it was a promise I couldn’t keep. Which sounds an awful lot like something Maeve would say to her daughter. I believe there is a door hidden in this place. A door to a new world. And that world may contain everything we have lost. Including her. Key to the creation of a complex and meaningful narrative is the relationship between the two characters. Akecheta and Maeve have a conflicted relationship spanning several years (Relationship Story Throughline of Past). They come together, then split apart. Come together, then split apart. Over and over again. Just like Maeve and her daughter. Just like Akecheta and Kohona. The ghost said we should be scared. No one’s going to come for us. There is nothing and no one in this world that will keep me from you. Akecheta is to Maeve as Maeve is to her daughter. As Kohona is to Akecheta. Destinies entwined with their inability to reach other the driving force between them (Relationship Story Issue of Destiny and Relationship Story Problem of Ability). Take my heart when you go. Take mine in its place. The Solution to a Problem of Ability is Desire. Another way to say this would be, “When you go and find we’re unable to reach other, know my heart is with you.” That’s a Relationship Story Solution of Desire. But that can only happen when Maeve starts Speculating on the possibilities of her connections with others, rather than continuing to Project. We will guard your daughter as our own. If you stay alive…find us. Or die well. And this is why Maeve’s final line of the episode is so moving. Not only does she resolve her Main Character Throughline of Understanding with Speculation, but she also heals the Relationship Story Throughline of the Past with Desire. Take my heart when you go. That feeling in your chest? That one that takes your breath away and brings tears to your eyes? That’s a story resolving with meaning and purpose. That’s a story—and an experience—you will continue to remember long after the narrative ends.